After an epic weekend at Timberman we spent the week staycationing at home. Mostly just watching movies and rubbing neosporin on D's road rash. The road rash and rest of the injuries seemed to be healing nicely. 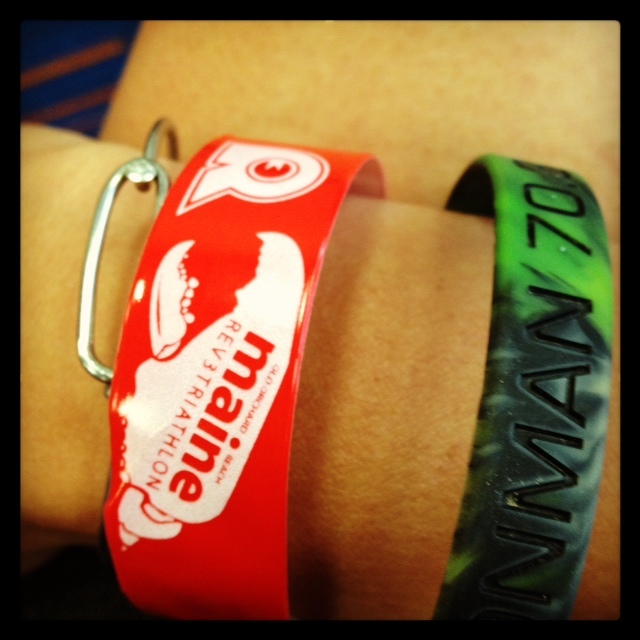 I had planned to be a part of a relay at Old Orchard Beach in Maine the weekend after Timberman. The original plan was to be on vacation in NH and ME for the week though we did end up spending Friday, Saturday and Sunday in ME. As usual when we are in ME we attempted to eat our weight in lobster. Old Orchard Beach is a Rev3 event, both 70.3 and Olympic distance. I was starting to get really bummed I wouldn't be racing the 70.3 myself. D was really bummed he was too banged up to consider signing up for the Olympic when extra spots opened up. We did get a nice ride on most of the Olympic course in on Saturday followed by a short run. 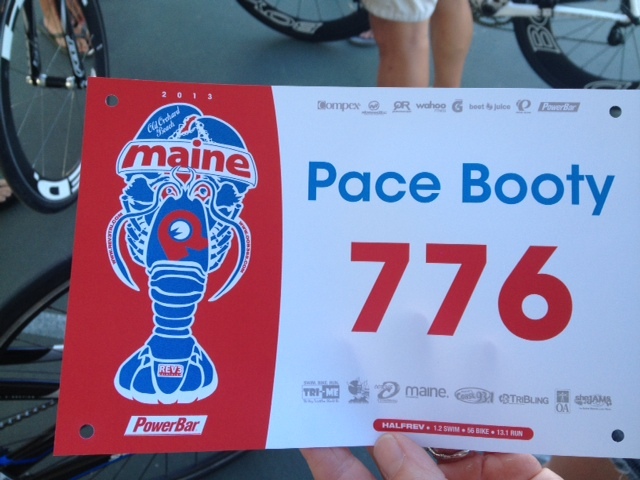 Then Team Pace Booty checked in, race ready! Sunday early wake up (AGAIN!) 3am is too early for anyone! Had to pay to park- URGH! But we were right by transition. 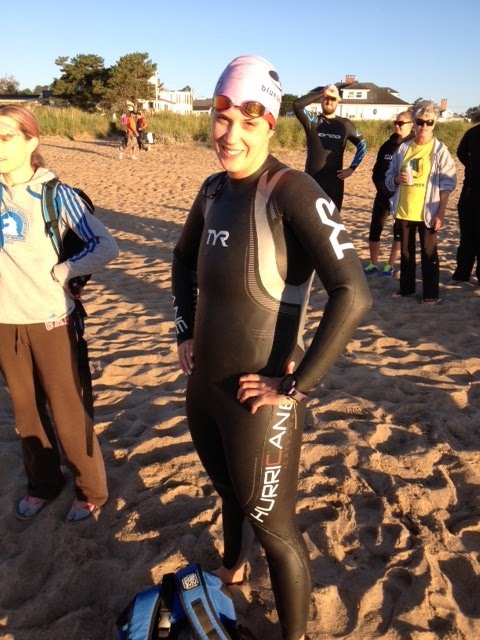 After helping out the team biker, Kellie, with some forgotten items, bottle cage, bottle and fuel, I put on my full sleeve wetsuit and headed to the water. Come on now of course I was doing the swim leg! As I hopped in to get some water in the wetsuit and try to get used to the freezing temps- my timing chip slid right off my ankle. MUTHER! I raced to the start to see if I could find someone to get me a new one. WHEW crisis averted and without the knowledge of the team runner! I placed myself out in the front of the wave and I was the first one to dolphin dive my way through the surf. The waves were tough on the way out but that meant current to ride on the way in. I found a guy I was going to draft off figuring if he was in the relay wave he had to be a legit swimmer. Well he may have been a legit pool swimmer but he was ALL over the place. Well forget that let's go! I put my head down and tried to bury myself in my swim. I was going to finish 1.2mi get to transition and I was done. 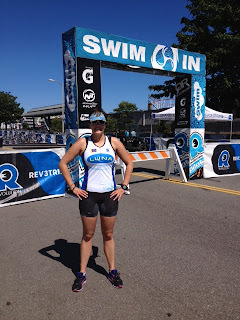 I had a goal for a 30 min swim or even better day sub 30. 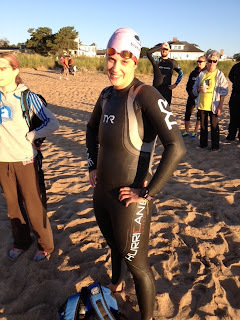 I pushed as much as I could even to the point of fighting back getting sick in the water. As I came out of the surf I looked at my watch- you have to be EFFIN kidding me! 34?!? How am I slower than last week and I pushed harder? This has to be a joke! Oh well RUN. There was a .3 mi run to transition. ARE YOU KIDDING?! And stupid me- didn't think ahead with that kind of run and put on a sports bra and tri kit I just went bathing suit with wetsuit. ROOKIE relay move! I ran as hard as I could. 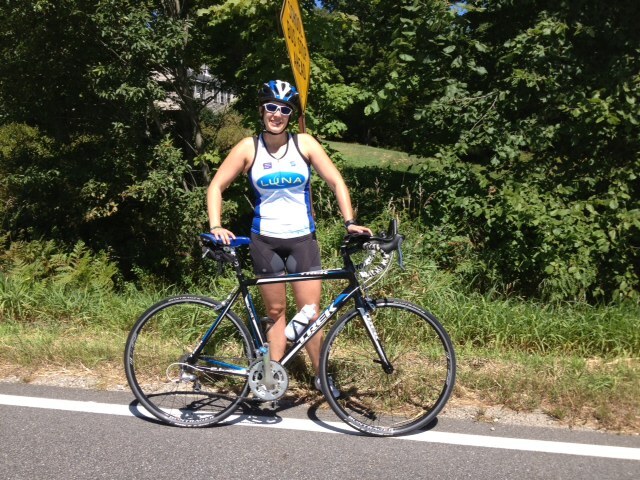 And got the chip to Kellie to rock the bike. After I thought I might puke but a nice big burp helped! I was done for the day so I changed up and hung out. It was strange to be sitting around. I am so used to this all being mine! It was strange to have other people to depend on. 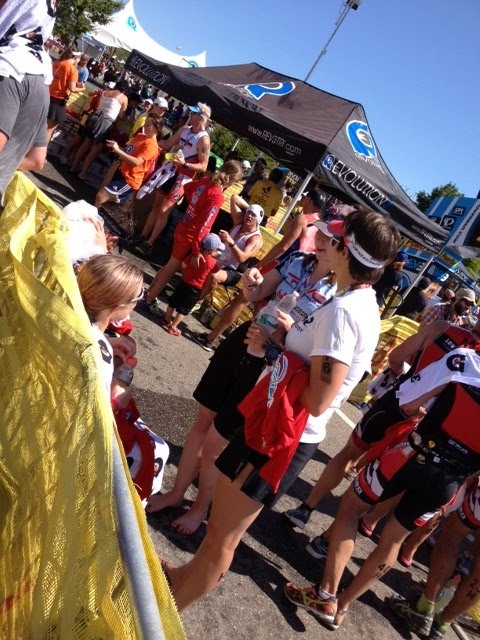 I watched some pros come and go in the Olympic and saw some friends come and go on their 70.3s. Then we sent off our runner, Sara, that little girl is a piston! 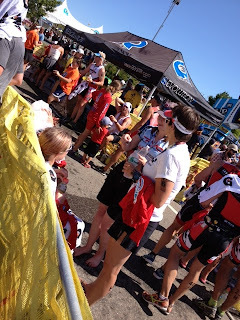 Kellie and I hung out and got to cross the finish with our team. 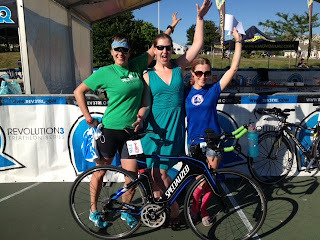 It was fun but a totally different tri experience than I am used to. Come to find out from friends after the swim course was measured incorrectly and people had anywhere from 1.4-1.45mi swim. So if that was the case- I'll take my 34min swim. This is what my wrist looked like as I headed back to the real world for a week worth of meetings- 70.3 Make-A-Wish racer bracelet and my Rev3 bracelet!